Ayfer Tunç is a short story writer and novelist who has been declared one of the most brilliant writers in Turkish literature. Her book My Parents Will Visit You If You Aren’t Busy: Our Life in the 70’s, first published in 2001, won the International Balkanika Literary Award in 2003. 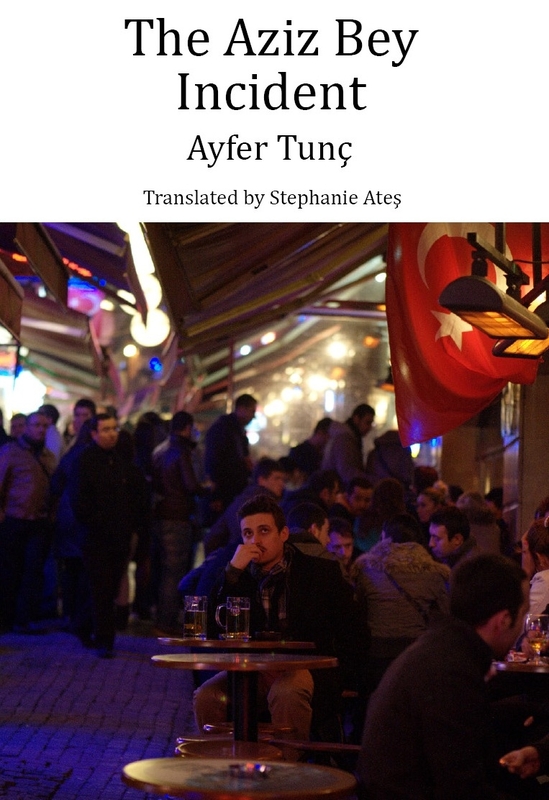 The writing of Ayfer Tunç is in essence urban, and yet she manages to imbue her characters with a fragile humanity and an old-fashioned sense of the melancholy of modern life. Now sample Ayfer Tunç’s writing for yourself. I was either going to die or be reborn from my old wounds. Women were my old wounds. Non-existent women. My decay, my life withering unbidden like a sheaf of grass; they were like rocks worn away by my worthlessness, flowing like running water. My cowardice, my cringing, my introversion. And then my beardlessness, the reason my wife cut my hair when it grew. My old wounds were the layers of cardboard I lined my shoes with, and the ones I replaced as they were worn out… Sundays at home… in secret. They were my wife’s large, but scary, black eyes that made one want to cry, and her bones bulging under her knuckles. They were the prints of red lips marking the coffee cups I carried in hands trembling with fear in my early youth when I was a merchant tailor’s apprentice. And they were my weird and wretched wedding photograph shot by the drunkard who ran the photographer’s shop in the neighbourhood. We both looked as though we were crying. But despite all this, I wouldn’t have wanted my end to be like this. I had no idea. A little before the tale that I am about to relate took place I was: between the ages of thirty and forty, between being married and being single, between being alive and being dead. My life resembled a straight, long, thin line. Something like a sick person’s endless moment of death. As if I’d been condemned to walk this long, thin line till eternity. Sometimes, seemingly always in winter in the late afternoon, I’d sit at the window end of my shop counter, stare out and ask myself, Am I a happy man? I had a passable shop, a passable wife, a roof over my head, a meal on the hob and two children. So I should be happy, I’d murmur to myself. And so I really thought, but I’d then catch a glimpse of the mirror opposite. I’d see a literally blue man, a face creased and shrunk like a cheap blue skirt lining. It was as though blue ink filled the lines of my face. My posture resembled an abandoned pet dog. For no reason I’d take down bunches of zips from the shelf, and swap the button boxes quite pointlessly. I’d attempt to sweep up the shop, and try to forget the abandoned, blue pet dog I saw in the mirror. And that’s why I abandoned myself to this strange game, like rolling very gently down a mound of sand lapped at the bottom by the waves of a warm sea. The game started after I met Turcan. Before him, a quiet old Jew sold stockings for varicose veins in the shop next door. If we met in the mornings he’d say, Hello neighbour, enter his shop and leave quietly in the evenings. One day he quietly died. Turcan bought the Jew’s shop. So quietness died too. If it had been up to me, when I met this man who covered his bald pate with a small chestnut wig and who, with every step he took, left an acrid, tobacco-like smell in the street, I’d wish him a dry good luck and defer introductions. But that’s not what happened. One day a small lorry drew up to the door, and as mirrors of different sizes were being unloaded an altercation began between Turcan and the porters. He dismissed the porters who’d already unloaded half of the mirrors, and sticking his head into my shop – without a by-yourleave, as if we’d been friends for forty years, and with a funny expression in his large grey-blue eyes, astounding and even frightening me, he cheerfully asked me, Gi’s a hand, neighbour? I couldn’t say a thing; there was the sourness of a lemon in my mouth: as if the words would come out shrivelled were I to speak. I came out of my shop, humped the mirrors on my back and carried them into his. That day he took me to lunch, which led on to his tales of womanizing. We drank rakı, and ate bean salad and pickled bonito. Turcan invariably talked about women. And I noticed that it was as though all the women he described were virtually boneless. I thought about those women’s hands, and my eyes were dazzled by the whiteness of their skin. And then how talkative and warm the women he talked about were. They knew how to laugh. And that’s the least of it. Women kept calling Turcan on his mobile. He exchanged smutty banter, roared with laughter and belched every now and then. His forehead sweated as he laughed, and when he wiped it away his wig moved. While he was speaking to women, to the women I imagined to be virtually boneless and so very pale, I thought how very many and beautiful women there were in the world. My wife never once came to my mind while thinking about the beautiful women in the world. My old wounds hurt. My rib cage felt as though it had collapsed after a huge punch, too tight for the trouble within me; all those tales of womanizing infested my insides like a deep and fatal affliction. A few days later, Turcan introduced me to two of his friends and took me out to dinner. Tales of womanizing multiplied and became more varied. They three tall men received calls from women non-stop, as they sat with their coats over their shoulders and spoke of cheques, maturity dates, and of course, women. I listened to them and laughed too late, struggled to understand. Late in the evening, they got up to meet go and meet the women they’d been talking about; I assumed a knowing smile and nodded meaningfully. They wouldn’t let me pay the bill. With avuncular smiles, they patted me on the shoulder. A coy snow fell as we left the restaurant. I said goodbye to them with a cordiality I’d never before shown, and as the three men raffishly got into the car brought from the car park, I said I’d take a cab and beckoned to a taxi. I opened the door of the taxi that stopped and waved to them before I got in. Their car passed under the street lights of the road now totally devoid of its daytime crowds, and, disappeared noisily like their guffaws. Turning to the taxi driver, I told him I’d left something in the inside and asked him to wait. Then I closed the taxi door and walked back towards the restaurant, but turned instead into a street and listened. I heard the driver wait for a while, then accelerate away in a rage, skidding on the empty road and screeching all the way. I came out of hiding and began to walk. The layers of cardboard I’d lined my shoes with had worn thin, my rib cage caved in, and I felt that my face growing bitter; yet I told myself, It’s from the snow, it’s from the wind. I turned into my street, to the dejected waving of the poor, threadbare washing on the lines stretched between the buildings. The lights of the street lamps changed from blue to orange, reflected in the dark windows of the neighbourhood that had long since gone to bed. As I approached home a strange joy grew within me. It was in front of my front door I took the first step into this game that was to bring me to a tragic end. An erectness sprung to my shoulders, as though I had grown taller. I stroked my non-existent beard with my hands blue with cold, and, despite having a key and knowing full well that the door buzzer was broken, I pressed the bell button by the entrance. Then I raised my head and looked up. Whether the lights in my flat were on or not, I cannot remember. This was because I looked, but I did not see; women of all types passed in front of my eyes. That is why I didn’t notice the anxiety (that I recalled much later) on the face of my wife who’d put on a cardigan over her flannel nightdress and come down five flights of stairs in a fluster. That night I know that I kept smiling as I slept. I had five nights like that. Five nights in short intervals… But each was more disagreeable than the previous; each time Turcan and his friends took less interest in me than on the previous one. At the end of the fifth night, they forgot me in the toilet. I was a handful of ashes they had blown away and scattered. The sixth night never came because they didn’t invite me again. But I continued these nights on my own. Why did I play this game, and for whom? I don’t know. But I enjoyed playing it while I did, I was happy. That’s all. Would I ever have played it if I’d known it would turn out like this? When I realised a sixth night wasn’t going to happen, I asked myself three questions. One: Was it anxiety I saw on my wife’s face – my wife who came down five floors to open the door for me at the end of these five nights? Two: I’ve a faint recollection of it being warm inside when I arrived home. Was it the alcohol that kept away the cold, or was my home warm because my wife had waited for me the whole night, and had thrown coal into the stove while waiting? Three: In the early hours of the morning of these nights, in the moments when I was about to pass into sleep from fantasies full of tales of womanizing, in the dark I’d feel my wife’s eyes staring at my face, and her short nailed, bony fingers whose tips burnt like fire wiping the sweat from my brow. At these times, I used to think I was dreaming. Furthermore, those bony fingers that entered my fantasies of beautiful women and angered me, and for that reason I used to have an uneasy sleep. Was this feeling the result of a dream or were those bony fingers real? Then I pondered. I found the answers to my questions. One: At the end of these five nights my wife was anxious each time I arrived home. I remember she whispered hurt, agitated words about her concern for me, and that I looked at her angrily with my bloodshot eyes and gave no answer. Two: During these five nights the stove had always been burning; in other words, my wife had waited up. Because when I got up in the mornings heavy-eyed I’d find the dying embers of a large piece of coal that had been thrown into the stove at some late hour. Three: I was angry at those fingers that wiped the sweat from my brow, with that bony but caring touch, because they were not the things I desired. But after harshly pushing away the fingers whose tips burnt like embers, I’d also hear a suppressed sob dissolve and disappear in a weak and tired body. And that’s why I began the sixth-night game. I was sitting in my shop, in my own silence. From next door came the sound of Turcan’s heels and female laughter reminiscent of the tinkling of cut glass. I imagined there was a crowd of women with Turcan. Virtually boneless, with sparkling complexions, chatty, lively women… Then evening fell, the lights from the chemist, the second-hand bookseller and the kiosk opposite came on one by one, reflected in the puddles of the cobbled street. The city’s tired and stooped people hastened their steps. I forgot to put on the lights. The women must have started to leave Turcan’s shop, because I smelt vanilla, lilac, lemon blossom and coconut. I closed my eyes tightly and sank into these strange, scented, invisible clouds. In the street the sounds abated, as the shops all closed. The rubbish from the stores and houses was piled up in the middle of the street. Then the sounds outside changed. They turned into vulgar yells, curses, screams, police sirens and the sound of running feet. Night fell, night progressed. I got up from where I had sat all day; I wound my scarf around my neck, put on my coat, and my cap that was too small for my misshapen head; I closed the shop and pulled down the metal shutters; I began to walk slowly. I walked up and down the road, how many times? I don’t remember. Then I entered a poky, cheap tavern, down four steps in one of the back streets. I drank half a small bottle of rakı in small sips, taking my time. I looked at my watch; it was much too early. While drinking my rakı my eyes kept filling with tears, I wiped them with the back of my hand; to those around I was pretending I’d got cigarette smoke in my eyes.